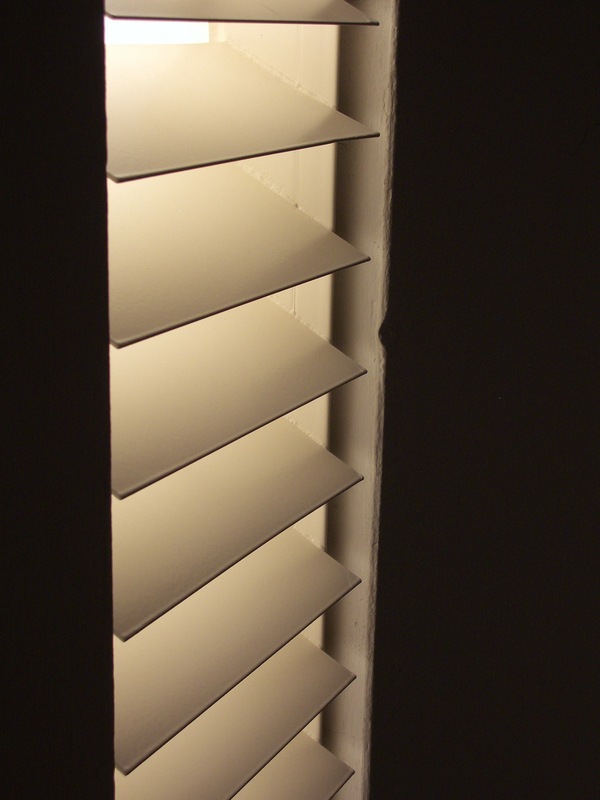 Back at the RCA, Robert Lye installed a Venetian blind and entitled the work Vertical Blinds, whilst Benjamin Orlow installed an actual Vertical Blind in the Goldsmiths MFA Interim Show. 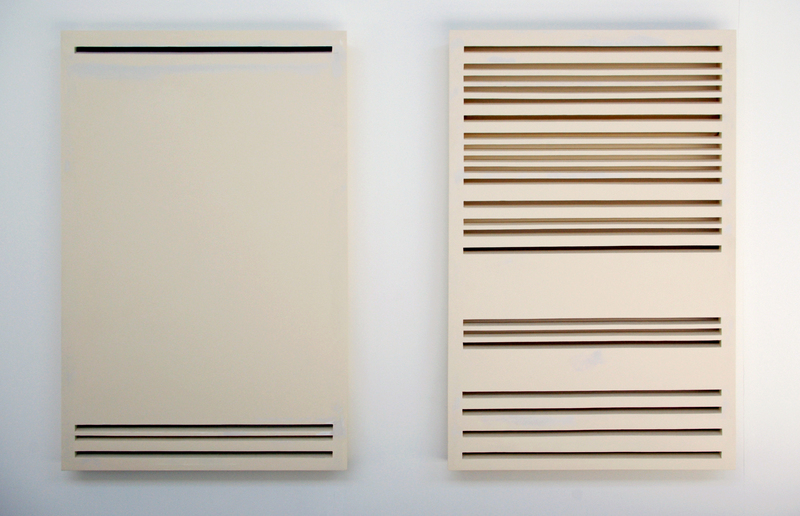 Lye’s work casts what should be a minimal series of parallel horizontal beams of light, however the blind is battered and indicates both the presence of and imperfection of people. 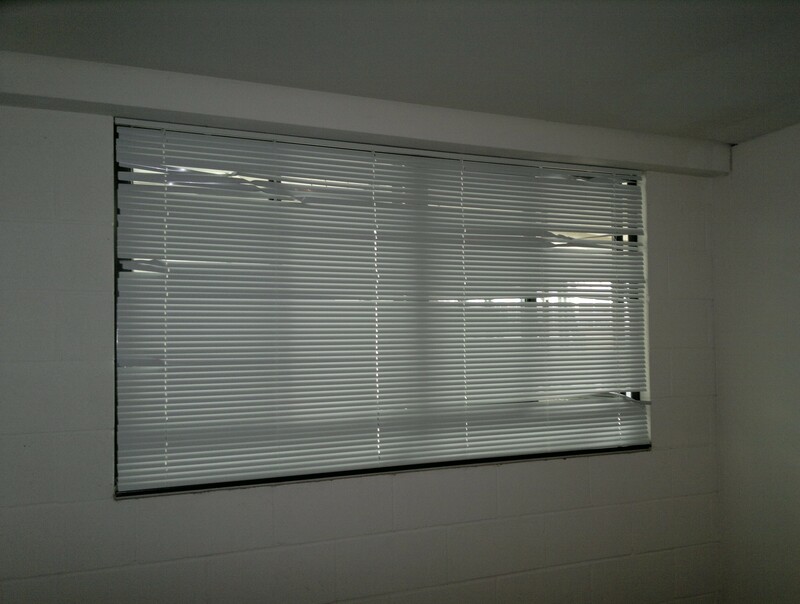 It also suggests the gesture of people having peered through the blind, snooping or spying on the neighbours. This brings up political issues surrounding surveillance and the erosion of privacy, and also since this is in an academic institution, universities being asked to monitor students for signs of extremism and potential terrorists. 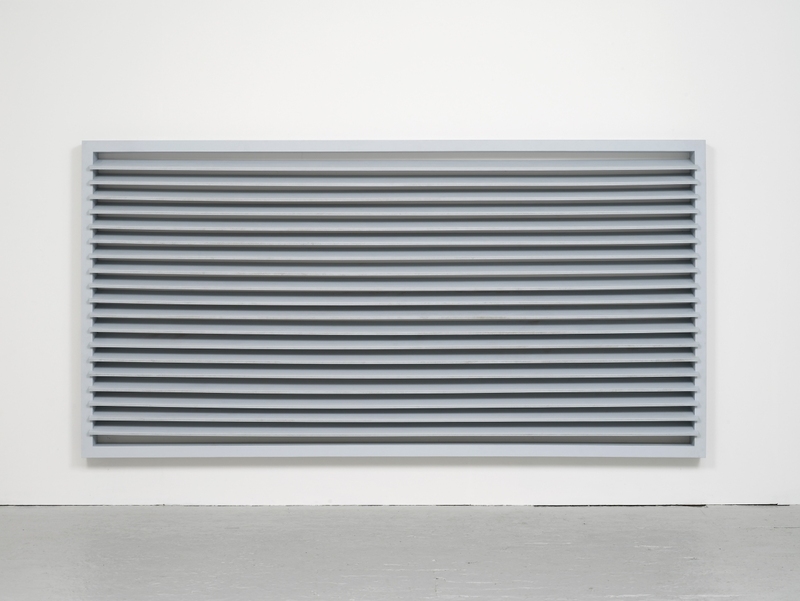 Similarly Giles and Knowland’s works could perhaps be about the privatisation of clean air, whilst Orlow’s blind is pristine and conforms to a slick, corporate installation, shutting the world out from seeing what really goes on in the business. Meanwhile the titling of Lye’s work suggests the world has been turned upside down, or to one side rather, implying some great catastrophe or political uprising has occurred. Roy Exley’s photograph Peripheries #7 in Charlie Dutton Gallery‘s Photo-Media Open Salon depicts light entering through a shutter in a similar manner to Lye’s installation and Giles’ and Knowland’s sculptures, though seems more subtle and still, like someone inside is just occasionally watching out the window for something to happen, patiently passing time or waiting for someone. 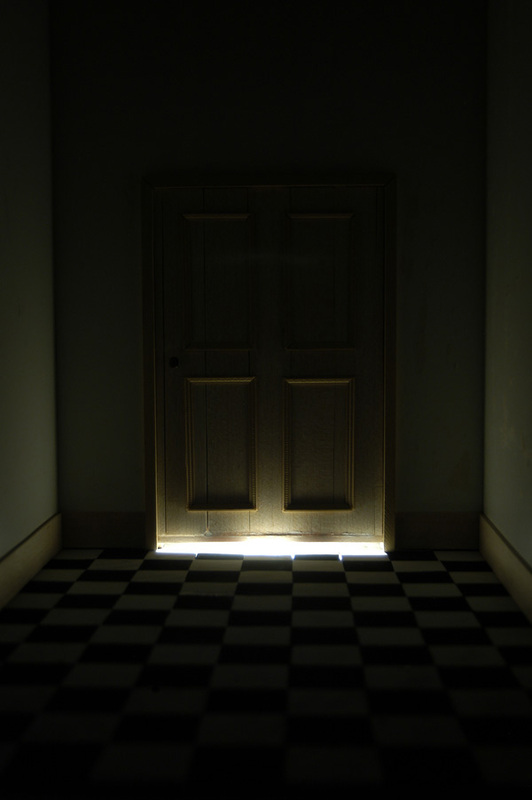 Meanwhile Aikaterina Kremasioti’s photograph REM shows light flooding under the door to the darkened space the camera is in and refracting around the room, which reflects upon Ceal Floyer’s Door (1995), in which Floyer created a similar effect by a slide projection of light onto the space beneath a door, both works leaving us to imagine what presumed action could be happening behind the closed door. 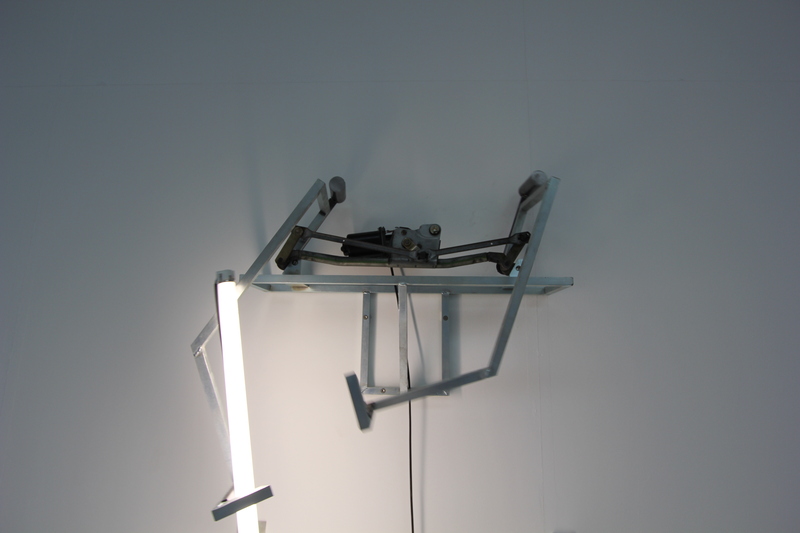 Back at the RCA, Mark Davey has made light flow in more than one way in his sculpture Catch (2011). A bare fluorescent strip light is swung back and forth by the mechanical piece like a swishing light sabre from Star Wars, in constant threat of smashing the tube, whilst more effectively following the repetitive form of a metronome. Musica da camera n. 182 (1989/2011) by Walter Marchetti. Baby Grand piano, E10 light bulbs, E10 bulb holders, cable, transformers. First realised by Walter Marchetti at the Fondazione Mudima, Milan, 1990. Photo by Marcus Leith. Like Davey’s work, Walter Marchetti’s Musica da Camera n. 182 (1989/2011) at Raven Row also uses lights as sculptural pieces. 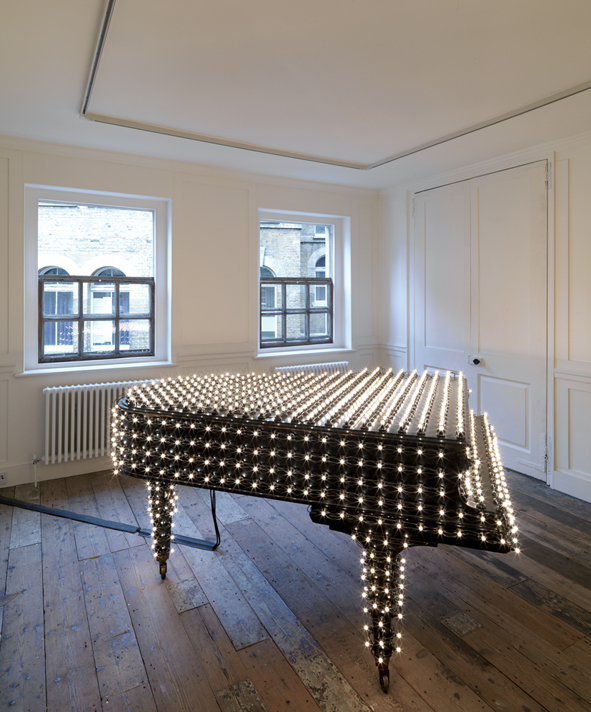 Marchetti’s work takes a grand piano and emblazons it with a network of hundreds of small filament bulbs, further aggrandising it like stars have lights around their dressing room mirrors. Through his adaptation, Marchetti has removed the usability of the instrument since opening the keyboard cover would result in smashing numerous bulbs, as we anticipate in Davey’s work, rendering the piano silent except for a slight electrical buzz. In addition to the dazzling light flowing from the piece, the work also emits a considerable amount of heat energy, demonstrating an interest in inefficiencies and the transference of energies that creates music through the instrument. Also at Raven Row are works by Max Eastley, which instead of having light flowing, have abstract objects seemingly defying gravity on a paper surface. It becomes apparent that these are controlled by both mechanics, probably using a clock mechanism, akin to Davey’s metronomic piece, which demonstrates the regularity of time like the pendulum of a clock, and the flow of magnetic attraction. Very similar kinetic works entitled The Circulation of the Universe (2010-11) have been produced by Sungfeel Yun in the Goldsmiths BA show, more like Anish Kapoor’s works such as Untitled (1997-8), creating a reflective spherical impression within the wall surface. Sungfeel Yun’s works use magnets and motorised mechanisms in a similar fashion to Eastley to create constantly evolving scenes with iron filings, ball bearings, and screws to discuss the narrow, flimsy bonds that form the equilibrium of life and society, as the iron filings teeter on the brink of a great fall to the ground. Photo-Media Open Salon 2011 is at Charlie Dutton Gallery, 1a Princeton Street, London WC1R 4AX until 30th July 2011. 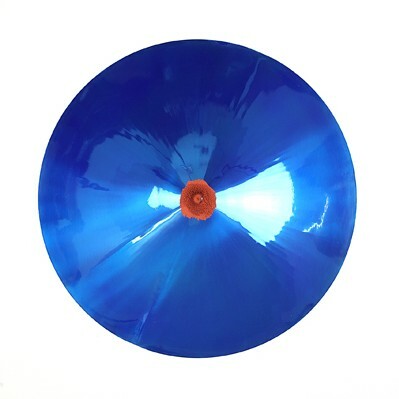 ‘Gone with the Wind’ – Pioneering sound artists Max Eastley, Takehisa Kosugi, Walter Marchetti, and Resonance104.4fm is at Raven Row, 56 Artillery Lane, London E1 7LS until 17th July 2011. Anish Kapoor: Flashback will be at Edinburgh College of Art from 3rd August – 9th October 2011, Nottingham Castle Museum & Art Gallery from 19th November 2011 – 11th March 2012 and Longside Gallery, Yorkshire Sculpture Park from 16th June – 4th November 2012.